Bought this in red as a Valentine's present for hubs who is a GA Bulldog can and wanted a red watch for his collection. I thought this was a good choice as it can be sporty or casual. It is a good quality watch, heavy. Very nicely packaged as well. The only reason I have 4 instead of 5 stars is the band doesn't seem nice enough for the watch itself. Hubs is happy with it. Good purchase. Whether you're dressing up or going casual, this bold watch is sure to garner many compliments. This handsome timepiece features a polished case and bold bezel with an outer dial that is designed with concentric circles and the inner dial is decorated with a pyramid pattern. Powered by Swiss quartz, its complications include a quick set date arc. Good watch and good with keeping the time and date. Excellent fashion look also. I love this watch. I wear this almost everyday! The rose gold color and larger than life size of the watch are exactly what I have been looking for. This watch matches all styles, from casual to dress. Nice weight of the watch for durability but not heavy on the wrist. I am in love with this easy to read, beautiful watch! 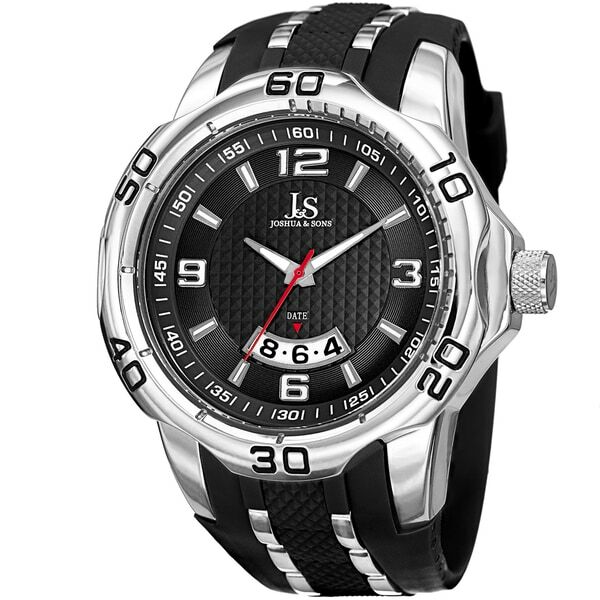 This is the 2nd J&S watch I've bought, love it, it is an oversize watch but wears very comfortably. Many complements from others on the style and size. ABSOLUTELY GORGEOUS WATCH... rich colors, handsome and certainly unique. The only reason it's not getting five stars is because this watch is H-U-G-E and heavy. If you do not have "thick" wrists (I don't) it is going to spin around your arm, unfortunately. I gave it a good try but eventually re-gifted from myself and passed it on to a friend. He has commented on its extreme HEFT/weight, but it fits him fine. This watch is beautiful! Solid-polished, easy to see the time and a good size. Well made and the rubber strap is very comfortable. The price could not be beat! I will start buying all my time-pieces through OverStock in the future. I would have given this item 5 stars if it came with an instruction book and warranty. Even at this terrific price those items should have been included. This was a gift to my grandson he liked it for his birthday and it still look good on his arm. SUPER DISTINCTIVE ORANGE COLOR AND LARGE EASY TO READ DIAL!!!! A GREAT PRICE. K was a little skeptical about a red watch! Sticking out like a sore thumb? But it came and I got to say it’s awesome!! Band really takes a beating and holds up to a really good! Watch is very well made! Just purchased another one! And looking for my third one now! This is a Christmas gift for my son. He is going to love it? Bought for my husband, who loves the color red. He really likes this watch and it's very nice. Nice looking watch but the face was huge. Very heavy!